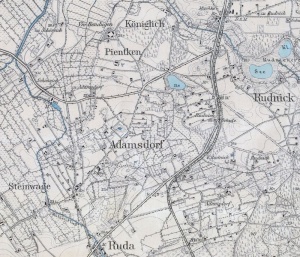 Source: [http://amzpbig.com/maps/2578_(1174)_Graudenz_1909.jpg Archiwum Map Zachodniej Polski]'']] Adamsdorf (also known as Rude, Ruden, Rauden, Rawden, Königlich Ruda, Adamowo, and Jadamowo; now known as Mały Rudnik; coordinates: 53.40595, 18.721733 [53° 24′ 21″ N, 18° 43′ 18″ E]; population in 1905, 427) is located approximately 9 kilometers (5.5 miles) south-west of Grudziądz ([[Graudenz (Kuyavian-Pomeranian Voivodeship, Poland)|Graudenz]]), 18 km. (11 miles) east of Świecie (Schwetz), and 20 km. (12 miles) north-east of Chełmno (Culm).
'']] Adamsdorf (also known as Rude, Ruden, Rauden, Rawden, Königlich Ruda, Adamowo, and Jadamowo; now known as Mały Rudnik; coordinates: 53.40595, 18.721733 [53° 24′ 21″ N, 18° 43′ 18″ E]; population in 1905, 427) is located approximately 9 kilometers (5.5 miles) south-west of Grudziądz ([[Graudenz (Kuyavian-Pomeranian Voivodeship, Poland)|Graudenz]]), 18 km. (11 miles) east of Świecie (Schwetz), and 20 km. (12 miles) north-east of Chełmno (Culm). Until 1772 Adamsdorf was located in what was known as Royal Prussia (also known as Polish Prussia) in the Kingdom of [[Poland|Poland]]. The First Partition of Poland in 1772 resulted in the creation of a new province on 31 January 1773, called [[West Prussia|West Prussia]], in which Adamsdorf was located. Adamsdorf was situated in the district (Kreis) of Graudenz in Regierungsbezirk Marienwerder until the end of World War I, when it came under the jurisdiction of the Pomeranian Voivodeship of the Second Polish Republic. Adamsdorf came under the control of Nazi Germany during World War II until March 1945, when it was occupied by Soviet forces and returned to Poland. In 2013 Mały Rudnik was a village in the administrative district of Gmina Grudziądz, within Grudziądz County, Kuyavian-Pomeranian Voivodeship. Thiessen, Richard D. "Adamsdorf (Kuyavian-Pomeranian Voivodeship, Poland)." Global Anabaptist Mennonite Encyclopedia Online. March 2013. Web. 25 Apr 2019. http://gameo.org/index.php?title=Adamsdorf_(Kuyavian-Pomeranian_Voivodeship,_Poland)&oldid=94020. Thiessen, Richard D. (March 2013). Adamsdorf (Kuyavian-Pomeranian Voivodeship, Poland). Global Anabaptist Mennonite Encyclopedia Online. Retrieved 25 April 2019, from http://gameo.org/index.php?title=Adamsdorf_(Kuyavian-Pomeranian_Voivodeship,_Poland)&oldid=94020.